I can remember the feeling I had when I turned the last page on Marshall Rosenberg’s book, Non Violent Communication. I wanted to buy a bus and travel around the country telling everyone about it, perhaps with a slide show or puppets or something, because I was utterly convinced this book could change the world. From being a social worker during the civil rights movement, to working diplomatically with governments and terrorists, Rosenberg has developed a process for healing conflict called Non Violent Communication (NVC.) Despite it not being a parenting book, it became one of my parenting Bibles. Instead of negotiating with terrorists, I learnt how to hold space for and how to validate my feisty two year old, and, perhaps more importantly, I learnt how to seperate my needs from hers. In the years since then, lots of people have worked on bringing NVC into the world of parenting, so parents don’t have to figure it out themselves. Over the next couple of months we’re going to be sharing some insight from them. We’ve interviewed teachers, counsellors and parents whose business it is to help families parent the NVC way. To start with, may we introduce Natalie from the Center for Emotional Education. The Center for Emotional Education works with parents who are up against some sort of struggle, dynamic, or problem that they really need to sort out, and they want to remain true to their values as a gentle parent. They don’t want to become a tyrant, bully, or enemy in order to make the situation change. That goal becomes possible when we understand how brains work with regard to emotions. Emotions form an often invisible dimension that is the driving force behind every single one of our interactions. Most of us are aware that when we are upset it’s harder to be kind and calm, and conversely when we feel wonderful it’s quite easy to find extra patience and consideration. We want to be good parents and treat our children with kindness and respect, so we should always strive to feel happy, calm, and centered, right? Well, unfortunately that’s not possible. Try as we might we will still get triggered, we will still have hard feelings, we will still struggle. We simply can’t design a life that excludes tough feelings – even if we’re smart and capable and trying hard. Luckily, that’s not how brains work anyway. Our brains are designed to shift processing into the part of the brain appropriate for the occasion. When our needs are met and we’re feeling wonderful, the upper brain is in charge. It’s great at logic, brainstorming ideas, finding empathy for others, and acting in accordance with our values. When intense emotion enters the equation, the upper brain shuts down and sends processing to the mid brain. The mid brain’s job is to identify emotion, feel emotion, check the environment to see if it’s safe, and receive connection. If it isn’t safe – if there isn’t time to spend with the emotion, or there isn’t a trusted ally to hold space and offer snuggles – the mid brain shuts down as well and the lower brain is asked to kick in. We’re all familiar with the lower brain! It is great at fighting, fleeing, freezing, or appeasing. We know when someone is acting from their lower brain when they are arguing, thrashing physically, running away, hiding under the couch, or sitting there with a blank look on their face. With this in mind, it’s not just a matter of having good feelings. Identifying and connecting with feelings, no matter what they are, is soothing to the mid brain, it communicates safety. When the mid brain feels safe it opens the doors to our upper brains and we are once again back in a brain state that can be kind, compassionate, gentle and cooperative. This information is so important! It is what makes it possible to work with children instead of against them. If we can identify what brain state they are in, we know how to help. It’s also what makes it possible to be the kind of parent we want to be. 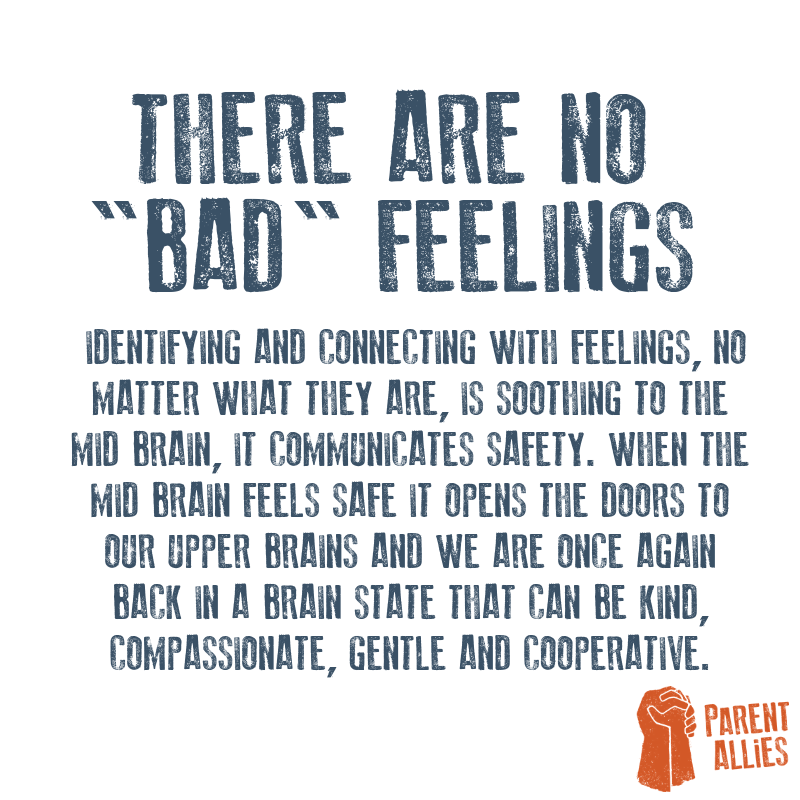 If we can work with our emotions, instead of trying to shove past them, we will rise into the part of our brains that is really excellent at parenting. Often parents feel they have “slipped up” when they experience waves of strong emotion. But we mustn’t consider having tough emotions, like anger, or guilt, as a setback or a failure of any kind. I see all emotions as vital. My job is to notice them, name them, and connect with myself and others about them. If I do this, if I honor these feelings they will lift. If I do this well, I may even unearth old feelings, historical inventory. If I hold those too, spend time with them, cry and get connection from myself and others, they will no longer continue to surreptitiously affect my processing. In this way, that initial “slip up” has served me beyond belief. 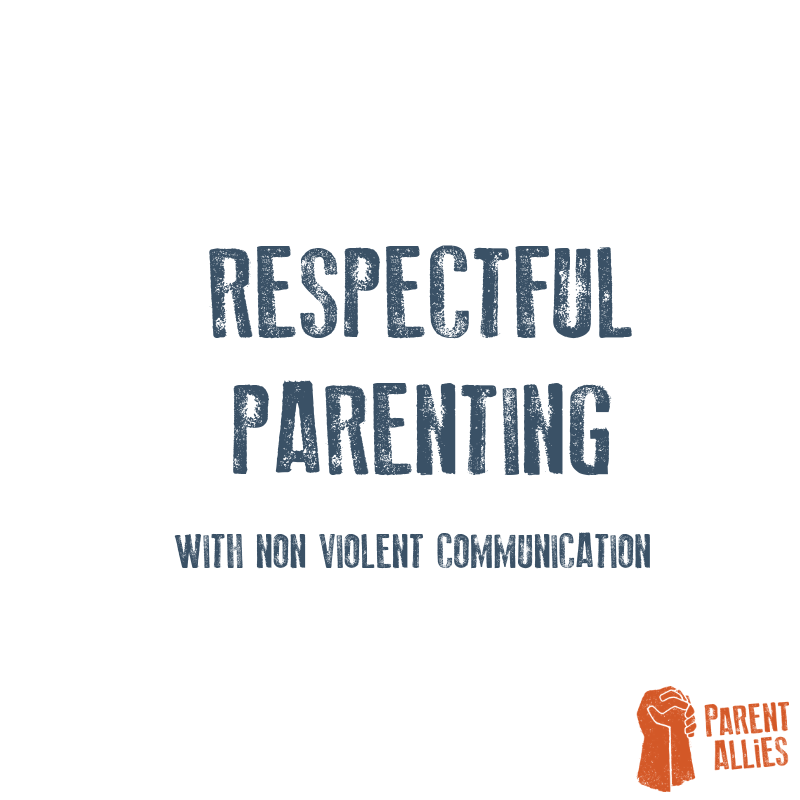 Keep in touch with our Non Violent Parenting Series to hear from people all over the world that are bringing this topic to life in the most helpful ways! We have spent the last twelve years helping folks get the hang of how their brains work, and how their children’s brains work, because all of our gentle parenting goals depend on it. You can check out our website: www.centerforemotionaleducation.com. If you want to jump in and get going on your own emotional development, we offer a complimentary “Feel Better Already” coaching session. Natalie Christensen is a mother, step-mother, writer, artist, coach, and certified Positive Discipline parent educator. Her aim is to support women and children in developing powerful emotional support systems that pave the way for lifelong success and happiness. Her joy is helping people feel good. 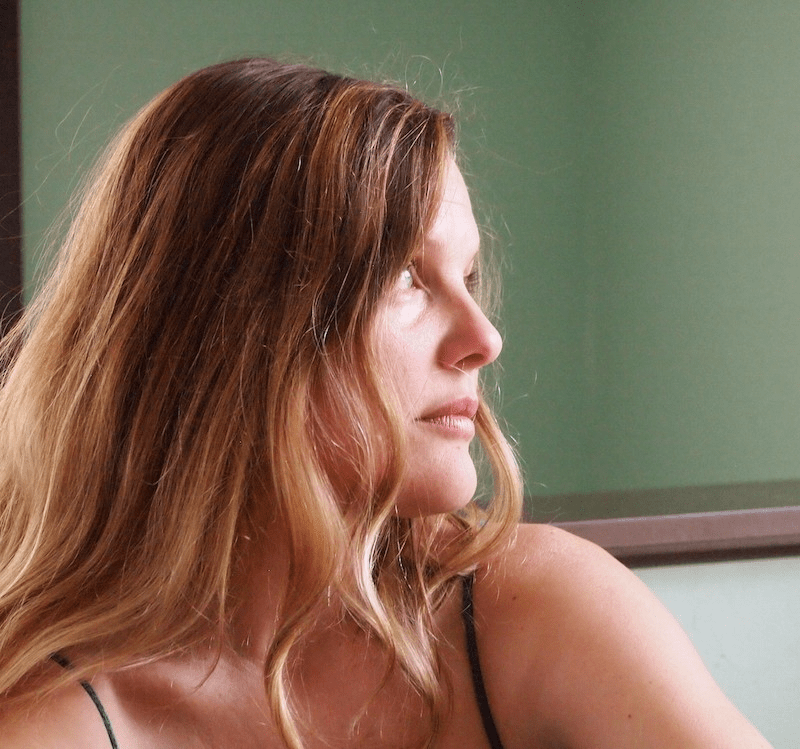 Natalie is co-founder of The Center for Emotional Education, and co-creator of Feeleez.